With the highest youth unemployment rate in the world, 28% of the MENA’s youth labor force (15-24 years old) is without a job. 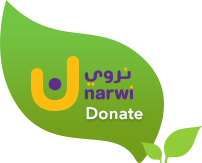 This means that over 7 million young Arabs must wait longer to gain their first professional experience and are unable to start saving for a home and marriage and ultimately begin on a path toward independence. “The Long Run” is an infographic jointly produced by Silatech and Visualizing Impact. 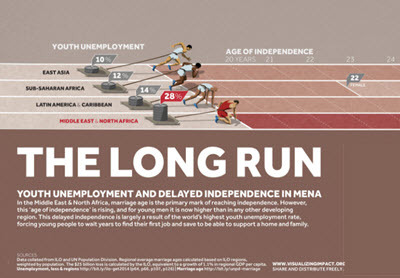 Youth unemployment and its effect on delayed independence – the focus of this infographic – nonetheless directly and indirectly contribute to the region’s sustained troubles. With the highest youth unemployment rate in the world, 28% of the MENA’s youth labor force (15-24 years old) is without a job. This means that over 7 million young Arabs must wait longer to gain their first professional experience and are unable to start saving for a home and marriage and ultimately begin on a path toward independence. In addition to taking a social and financial toll on millions of young people, the high youth unemployment rate adversely affects the region’s economies. It is estimated that the region’s Gross Domestic Product (GDP) could increase by $25 billion by 2018 if the youth unemployment rate is reduced by half. “The Long Run” is an infographic that comes as the result of a collaboration between Silatech and Visualizing Impact. Visualizing Impact is a creative design studio that focuses on social issues.